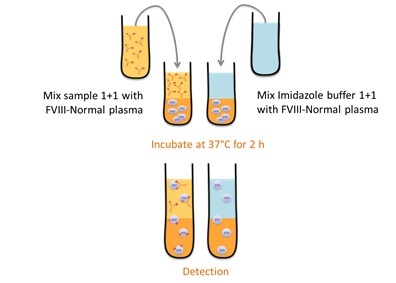 The Factor VIII Inhibitor Kit is a kit for the determination of Factor VIII Inhibitor according to Bethesda with improved specificity in the lower range of antibody detection due to dilution with buffered normal FVIII plasma (1 I.U.FVIII/ml). The kits contains a Factor VIII Inhibitor Plasma as positive control and a Factor VIII Inhibitor free plasma as negative control. Calculation Software (Excel) is available in the customer area. FVIII Inhibitor Kit HCV neg. 1 x 1 ml Factor VIII Inhibitor Plasma HCV neg. FVIII Inhibitor Plasma HCV neg.